We recently provided a 5 day school tour through PGL to Paris, France. We have a long standing business relationship with PGL, a company who provide support to schools in the organisation of trips and tours that through their considerable experience will engage, nurture, challenge the kids to help them develop in environments outside of the school room. It has always been our absolute pleasure to provide our executive touring coaches for these tours as we consistently hear positive feedback from our drivers upon their return. A driver recently commented that PGL tours have well thought out itineraries with great consideration to the drivers’ needs and that they provide tour reps on every tour enhancing the experience for the students as well as supporting the drivers with their duties. We also consider it to be a great compliment to our service when the schools who PGL work with request the same driver for their next tour. Outside of our relationship with PGL we also provide tour operator transport for many other companies wishing to take groups of all sizes across the UK and even further afield across Europe. 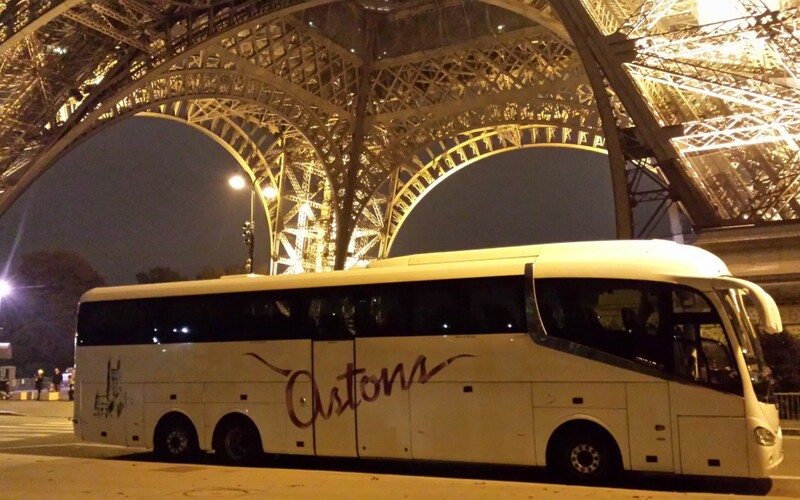 For those of us who spend most of the time sat behind a desk here at the depot, one of the most exciting things about these tours is seeing our coaches parked in front of some of Europe’s most impressive landmarks. In the case of the picture above you can see our beautiful 59 seat Irizar i6 parked just underneath the not to shabby Eiffel Tower. If you would like to read more about our tour operator transport services and find info on just some of the companies who use Astons for this service you can find more information on our tour operator transport page.